WAIKIKI BEACHES REOPEN: Signs warning of contaminated water were removed yesterday from Waikiki beaches, yet swimmers were few along popular shorelines like the Royal Hawaiian Hotel. Health officials credit the sun, wind and tides for quickly clearing contaminated waters. 34-year-old mortgage loan officer Oliver Johnson has flesh-eating disease. Chef brings healthy philosophy to benefit dinner with Sam Choy. He is filling in for injured Ross Dickerson while waiting for word on his eligibility from the NCAA. One expert says the monthly statistics are deceptive and the island's housing market has cooled off. 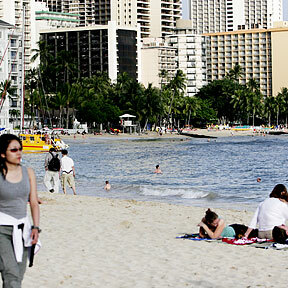 Hawaii and China have signed an agreement for cooperation on tourism.